Six day programs to manned launches from Baikanur! For 2019 is planned a group tour o.l.v. Jakob Terweij from 16-21 July to the launch of the Soyuz MS-13. We point out that a permission issued by the Russians is necessary for a visit to Baikanur. 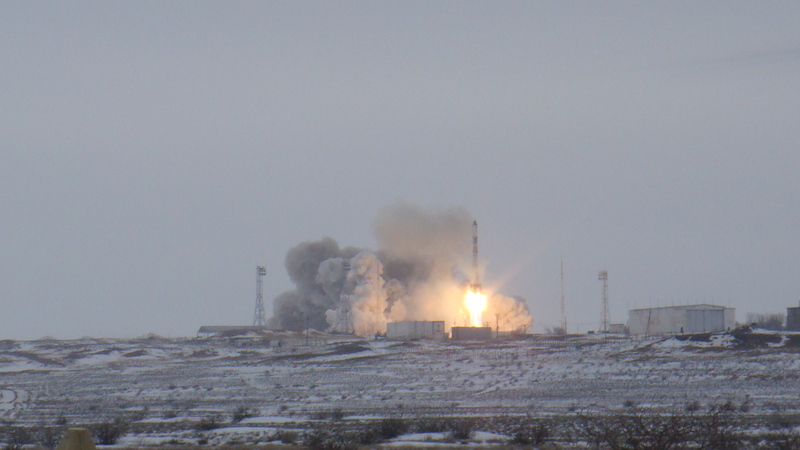 After all, Baikanur is a part of Russia situated in Kazakhstan, managed by the Russian space agency Roscosmos. The application for this permission must start 60 days before your arrival in Baikanur. Disclaimer: it is possible that a permission, and even at a late moment, is not given. Launches can also be postponed. Most launches take place at the scheduled time. Tour program for 6-day tour to witness Baikanur manned launch MS-13, planned for July 20, 2019. *changes may occur depending on decisions of the Baikanur authorities and all mentioned flight times may change. City tour (4 hours) with the group. Astana has been the capital of the country since 1998 and international top architects, including the British star architect Norman Foster, have built the most modern buildings here. You can see Astana’s landmark, Bayterek, a 97-meter-high observation tower with the golden egg of Samruk, the “Tree of Life”, Norman Foster’s Pyramid “Palace of Peace and Harmony”, and the largest mosque donated by the Emir of Qatar. Leisure time. Flight Astana – Kyzylorda at later determined time. Arrival in Kyzylorda, continuation by bus to Baikonur. Transfer to hotel Zentralnaya. Leisure time. Today, you watch the Soyuz rocket being moved from the Hall to the Launch Site No. 112 (an excursion of 4-4,5 hours.). – Transfer to Launch Site 2, which is the Museum of the Baikonur Cosmodrome – there are many interesting exhibits, such as the suit of Gagarin, in which he flew, the radio system with which Korolyov spoke to him. Jakob will explain much about the space travel of yesterday and today. – A visit to the Buran museum. Nearby are two small houses, one in which Gagarin stayed after his space flight, in the other one Koroljow lived for 9 years. – Transfer to Launch Site No. 41 where Marshall Nedelin is buried. Visit of the museum for the history of Baikonur City. With simple means, people begun here building the world’s first ‘Earth Orbit railway station’. There are many photos, models of various spaceships and installations, and many other things. After this visit you will have a good general picture of Baikonur. Return to the city. Leisure. Today you will visit the Tschelomej School. Transfer to Launching Platform No. 254. Then the cosmonauts come out, report that they are ready for the start. There is a classic speech. The cosmonauts say, “Ready for the start” and the head of the state commission says: “Good luck!”. Then the cosmonauts immediately go into the bus.. Transfer to Launch Site N2 and watching the Start. Return to the hotel and one more night of accommodation. At 05:30 AM transfer to the border point in Baikonur and continue by bus to Kyzylorda Airport. 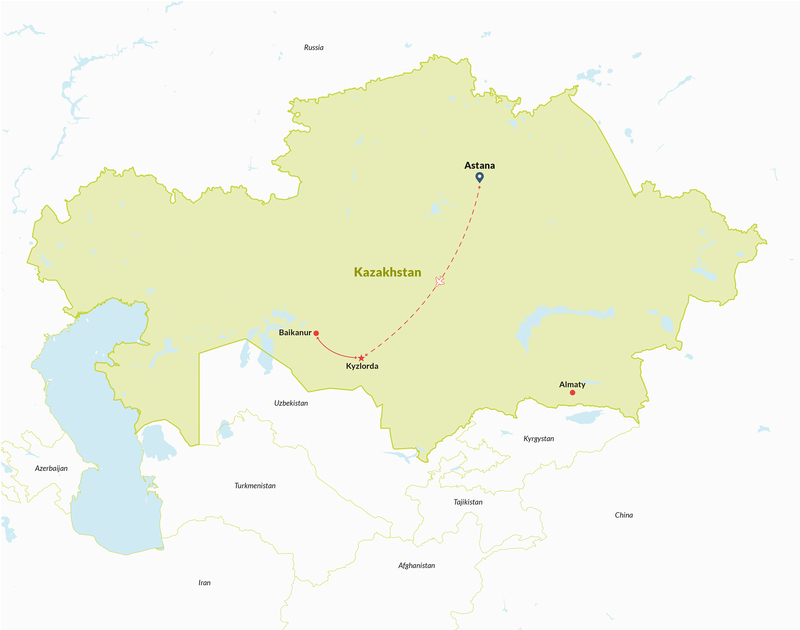 Flight Kyzlorda –Astana at designated time, usually around noon. Transfer from Astana Airport to the city. End of services. Optional and individual program in Astana or in Almaty is possible. Prices are indications and may vary slightly per launch. Groups are put together internationally, you can register individually. – excursions as mentioned in the program o.l.v. Jakob Terweij. – the permission to visit Baikanoer. This must be requested by us at least 45 days before the launch! For this we need a copy (scan) of your passport. Not included are international airline tickets, airline tickets Astana-Kyzlorda-Astana (estimated € 150-200 total), lunches and dinners, single supplement in the hotels in Astana & Baikanur (€ 125 total), breakfast in Baikanur, individual transfers in Astana and the services not mentioned.